Former US military leaders have called on the Bush administration to make major cuts in greenhouse gas emissions. In a report, they say global warming poses a serious threat to national security, as the US could be drawn into wars over water and other conflicts. They appear to criticise President George W Bush's refusal to join an international treaty to cut emissions. Among the 11 authors are ex-Army chief of staff Gordon Sullivan and Mr Bush's ex-Mid-East peace envoy Anthony Zinni. The report says the US "must become a more constructive partner" with other nations to fight global warming and deal with its consequences. It warns that over the next 30 to 40 years, there will be conflicts over water resources, as well as increased instability resulting from rising sea levels and global warming-related refugees. "The chaos that results can be an incubator of civil strife, genocide and the growth of terrorism," the 35-page report predicts. Writing in the report, Gen Zinni, a former commander of US Central Command, says: "It's not hard to make the connection between climate change and instability, or climate change and terrorism." He adds: "We will pay for this one way or another. 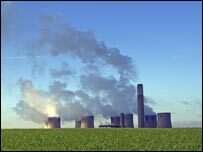 We will pay to reduce greenhouse gas emissions today, and we'll have to take an economic hit of some kind. "Or we will pay the price later in military terms. And that will involve human lives. There will be a human toll." The report was issued by a Virginia-based national security think-tank, The CNA Corporation, and was written by six retired admirals and five retired generals. Climate scientists broadly endorsed the report. But Stanford scientist Terry Root, a joint author of this month's international scientific report on the effects of global warming on life on Earth, said its timescale might be too alarmist, as some of the predicted events - while likely to occur - could take longer than 30 years to happen.